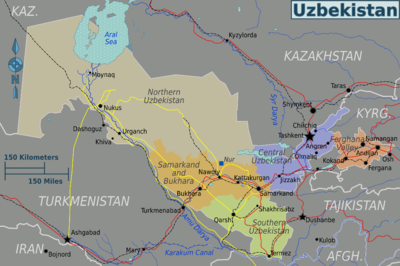 Uzbekistan is within the South-Central Asian Union and has borders with other member states of Afghanistan, Kazakhstan, Kyrgyzstan, Tajikistanand Turkmenistan. It is doubly landlocked, but includes the southern shoreline of the Aral Sea. The meaning of the name Uzbek is disputed. One version is that it is derived from Turkic ‘uz/öz’ (‘good’ or ‘true’) and ‘bek’ (‘guardian’). Uzbekistan is rich in history. Samarkand was conquered by Alexander the Great. Islam was introduced by Arabs in the 8th-9th century. The most famous leader to come from Uzbekistan is Tamerlane who was born in Shahrisabz south of Samarkand. Russia conquered Uzbekistan in the late 19th century. Stiff resistance to the Red Army after World War I was eventually suppressed and a socialist republic set up in 1924. During the Soviet era, intensive production of “white gold” (cotton) and grain led to overuse of age agrochemicals and the depletion of water supplies, which have left the land poisoned and the Aral Sea and certain rivers more than half dry. Uzbekistan gained independence in 1991, following the break up of the Soviet Union. The country is nominally a democracy, however, from 1991 to 2016 the country was run by President Islam Karimov, whose security services are widely believed to have killed several hundred protesters in Andijan in 2005 and have been responsible for some severe breaches of the most basic human rights (torture and killings). Karimov passed away in September 2016, and the country has since been locked in political tensions as individuals are now eager to improve the Uzbek economy and ease its isolated position from the rest of the world. The country is extremely wealthy in natural resources, yet very little wealth falls into the hands of the locals. May 9 Remembrance Day, Peace Day or Liberation Day (Xotira va Qadirlash Kuni), remembering that Uzbek troups participated in the Soviet army and that 500.000 Uzbek soldiers were killed in World War II. The most fertile and populous part of the country, but also its most unstable with different ethnic groups like Uzbek and Kyrgyz have disputes. Geographically dominated by the vast red sands of the seemingly endless Kyzylkum Desert and politically dominated by Qaraqalpaqstan, the vast autonomous republic of the Qaraqalpaqs, Uzbekistan’s North is most notable in travel circles for the ancient Silk Road city of Khiva, and for the dying Aral Sea. This is truly the heart of the Silk Road, the passage along the Zeravshan River valley through Central Asia’s most important historical cities of Samarkand and Bukhara and heavily populated mainly with Ethnic Tajiks. The one mountainous part of the country, where Uzbekistan meets the mighty Pamir Mountains, is heavily ethnic Tajik. The political and economic center of the country, surrounding the capital, Tashkent.